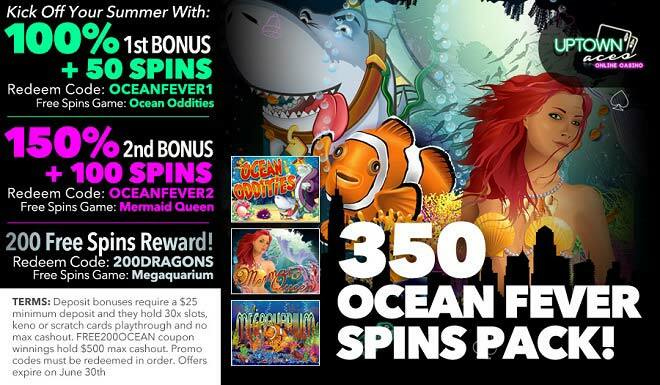 Get Ready for Summer With Uptown's 350 Ocean Fever Spins Pack! Summer is almost here – are you ready for some serious Uptown heat? Hit the pool of winning chances and help us welcome the sunny season with scorching bonuses and a 350 Ocean Fever Spins Pack that are yours when you deposit $25! There are only a few weeks left before summer begins so you better get started on your Uptown wins with a 1st 100% Bonus + 50 Ocean Oddities Spins, a 2nd 150% Bonus and 100 Mermaid Queen Spins plus a 200 Free Megaquarium Spins Reward! It’s time to mark your calendar as you prepare for summer Uptown wins and welcome the sunniest months of the year with a 350 Ocean Fever Spins Pack!